Choose your parents. Choose to be born during a specific period of history. Choose your gender. Choose your race, ethnicity, language and social class. Choose your level of intellect, your various talents, the size and shape of your body, the color of your eyes, the strength in your arms and legs. Choose your level of health. Choose your personality, character and unequalled tenacity. Then choose the conflicts and accidents to befall you. Be aware: the pre-birth menu does not offer the choice of “no accident”. You must choose something. Nazis or Soviets should bust down your door, a tsunami must wreck your village, a pipeline should explode near your place of work, a father should beat you, a Sandusky molest you, a priest have his way with you, or a stray bullet must pierce your (very much beloved) infant brother’s skull. If you’re to avoid violence or natural disaster, you must at least choose to face some injury or illness, either a physical defect or mental trait that renders you stubborn, foolish or relentlessly sad. Perhaps you’ll be obese, depressed or suffer from acid reflux. There’s just no way out of this. We’ve yet to see anyone, even members of the über-class, spend a life without conflict. Jesus was tortured to death. The Buddha found suffering everywhere. Socrates drank hemlock. Bill Gates is a nerd. Warren Buffett feels guilty about his secretary’s taxes. Now, conflicts and disasters aside, build your business (or maintain your occupation) yourself. Mine your own ore. Smelt your own metal. Forge every single tool, nail, screw and bolt, every girder and corrugated sheet. Farm your own trees; cut and transport your own lumber. In the process, make your own energy; dig your own wells. Fix every last thing yourself. Raise and educate your children without any teachers, schools, scientists or coaches. Heal every ailment; treat every sore without a single doctor or nurse. Also, make your own weapons (also without scientists) to defeat or neutralize your enemies without any help from conscripts, volunteers or manic patriots. In the process, grow, raise, harvest and cook your own food. While eating, think things through carefully, tenaciously: have you prepared yourself for every possible calamity, including your certain death? In short, have you dug your own grave? And can you be sure to remain standing near its foot at the hour of your death? Because if you happen to drop dead in some other place, you cannot expect anyone to drag your cadaver across the empire of your ego. They’ll all be too busy fending for themselves to notice that you’re gone. Categories: Culture, Uncategorized | Tags: Extremism, Fate, Individualism, Luck, Objectivism | Permalink. The experience taught me about problems in any discussion or accusation of bigotry, especially across groups that have very different sensitivities. Is America racist? Well…yes, quite. But the Herr Professor’s question was also bigoted, loaded with idiotic assumptions, including the belief that it’s somehow fair to ask a single representative of a community or group to first speak in its name, then explain something notable about its sociology. The pupils and instructor seemed ready to draw very serious conclusions from my answers, and the class turned into the interrogation of a twenty-three year old, almost a test. Would you marry a black girl? Do you have any friends who are black? Would you work for a black boss? Do you believe black people are as smart as white people? The Herr Professor, much to my shock, did nothing to reposition or edit the self-incriminating questions. This is exactly the sort of self-incrimination coming from those who have rushed to the defense of Petras Lescinskas, the unfortunate Lithuanian basketball fan found guilty of a racially aggravated offense at the Olympics. Among the defenses is this misguided juxtaposition of hand gestures separated by over 70 years of history. In Facebook discussions, and in the comments under articles covering the arrest, you’ll find all sorts of banter. A faction claims that Lescinskas didn’t mean to be racially offensive and, therefore, wasn’t. He was just a passionate fan, and the British cops perceived him as racist. He should have freedom of speech. The apologists also claim that the hand gesture means all sorts of things. Well, yes. It does and has, most likely dating back to the dawn of civilization. The raised arm on this man is honoring Shiva, and these elementary school pupils are posing for a stock photo. Lescinskas, however, had something very different in mind from Rowan Atkinson or even the Olympic statue (that predates WWII). Few people see a Lithuanian saluting with the arm and imagine him imitating the statue, paying tribute to Shiva or asking for Herr Professor’s attention. Lithuanians have earned a reputation for tribalism, small-mindedness, drink and boisterous non-sense, especially at sporting events, concerts and festivals. The behavior of Lescinskas and his entourage, bigotry and all, makes far more news than Lithuanian efforts toward sustainability, for example, which many countries could learn from. But Lithuania could do well to start taking cues from European neighbors like the United Kingdom when it comes to points of view on race and ethnicity. The bigotry expressed by this basketball fan and his apologists does not exist in a sub-culture. Conversations about race with Lithuanians–even those who have lived abroad for decades, or others who are quite well educated–are often tedious. I’ve met plenty of Lithuanians who look at race and ethnicity as absolutes, not social constructs; they’d think me insane, for example, if I suggested that a Nigerian could become a Lithuanian or vice versa. But ask for a definition of “Lithuanian”. Four nationalists will give you four definitions, each one vehemently dismissing the others. You realize how delusional and isolating it is to believe ethnicity is the sun at the center of an identity system. Consider the photograph posted below, Lithuanians in blackface. At one point the performance had been available on YouTube but has since been taken down for copyright infringements. 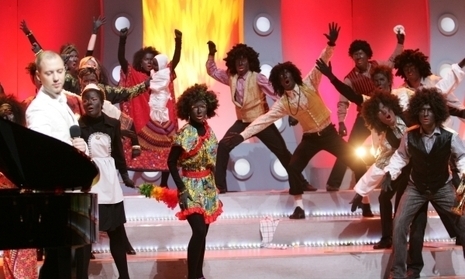 It is from a television show called Chorų Karai (Choir Wars), one of these live competitions. The show aired in primetime, the summer of 2006, on national Lithuanian television. It showed Lithuanians in blackface–some dressed as maids, others in odd adaptations of traditional African garb–all of them dancing about while, at the piano, a man in blackface (not pictured) led a version of Ray Charles’ “Hit the Road Jack”. I told my friends, all of them college-educated, that this was rather offensive. They told me I was taking it too seriously; I was being American. Americans see racism everywhere. When I pointed out the history of the minstrel show, they all waved it off. These people don’t know anything about that. They’re just trying to have a good time with a song. They’re not trying to insult anyone. It’s a performance. They’re just acting like blacks. Second City’s ETC, the training ground for the comic troupe, has a rule about writing comedy and satire. You’re not allowed to make fun of or represent a group unless you are a member of that group. I don’t necessarily agree with it but understand the reason for it. It helps to keep the proper sensitivities and perspectives in place. Categories: Culture, Ethnicity, Lithuania, Race, Uncategorized | Tags: ethnicity, identity, Lithuania, racism | Permalink. During your past few Olympic basketball matches, a handful of Lithuanian fans disturbed the games by mimicking apes and making obscene racist gestures. This is, by any standard, outrageous behavior that stands in direct contrast to the spirit of the Olympics. While the majority of your fans behaved themselves and supported their team respectfully, they did not make the news. The minority of racists did, of course, as their behavior is extreme and, sadly, contributes further to Lithuania’s well-deserved reputation of intolerance and bigotry. You cannot ignore this. These are your fans. They have come to support your team; by default, just like you, they are representatives of an entire country. Any team, no matter how popular or obscure, contributes to its culture of fandom through its own behavior, politics and official stances. If you ignore these fans, or if you pooh-pooh their behavior as the minor actions of a foolish handful, you indirectly enable it. It is not enough that arrests were made by English authorities or that an English judge threw the book at a fan. You must also act on your own accord. It is with deep regret that we, the Lithuanian Basketball Federation, faced the news that a handful of our fans tarnished the Olympic games through racist behavior. This is deplorable and embarrassing. We have not come to the games in this spirit. We denounce the fans who behaved in this manner. They are not representatives of Lithuania or our greater international fan base. Our players respect their opponents, and the team knows what a great privilege it is to play in the Olympic games before a worldwide audience. Lithuanians have a tremendous love of basketball, at home and abroad, and take great pride in their national team. The team takes the court with a spirit of sportsmanship, and we participate in the Olympics as members of a unified global community. Racists and neo-Nazis have no place in our fan base. You might argue that this is absurd. Should Christopher Nolan make a statement in the wake of the mass murderer who claimed to be inspired by The Dark Knight Rises? He should not have had do. However, he did. Categories: Culture, Lithuania | Tags: basketball, Lithuania, Lithuanian national team, neo-nazi, Olympics, racism | Permalink. 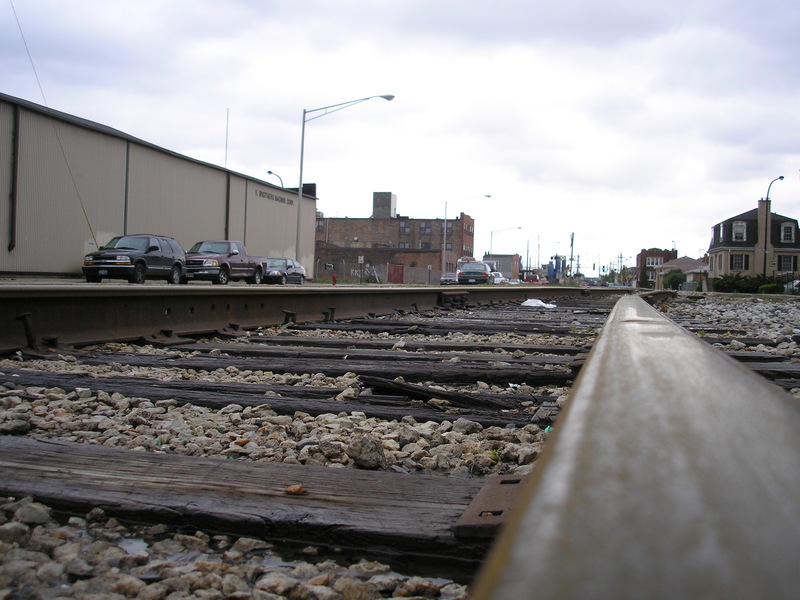 This is a blog post I composed in July of 2010 only ten days after being in an armed robbery. It is the only entry I’ll resurrect from the old version of Liquid Ink, and I’ve edited it only slightly. While writing it, I had no way of knowing that the event would trigger a psychological deluge of emotions, memories and ideas that would eventually lead to PTSD. I was held up at gunpoint earlier this month (7/2010) while buying cat food at a local convenience store. The store is only a few doors from my home in Oak Park, IL, a “yuppy-hippy” village of mansions and boutiques (or, in my case, affordable condos in close proximity to public transport). This typical shop offers specials for police, and there’s usually a Chicago or Oak Park squad car parked out front. Sometimes the store seems a regular tea party for cops, as five or more will be standing around and chatting with the cashiers or managers. However, there were no cops in the shop now. I was swiping my ATM card when the thugs came in, three of them, one with a bizarre bandage meant to disguise half his head. The ring leader wore a brown and white baseball cap, and the lookout was dressed in a brown or maroon hoodie. Bandage boy put one hand on my shoulder and stuck something hard and blunt into my kidney, probably his knuckle. He whispered “Don’t move.” My first instinct, an impulse that surprised me, was to see if the tools had guns, and I relaxed when I noticed the ring leader holding what looked like a .45 caliber automatic pistol. That hand cannon relieved me of some pressure. Had these punks come in with knives, my civic and moral duty would have been to throw them through the glass. But now I could just let them get on with the robbery. The bandaged one turned me around and pushed me up against the counter to be sure I wouldn’t move. He kept his hands on me the whole time, sometimes holding his thumb near my temple. As I remember this now, rage surges through me, but I was perfectly calm during the robbery, holding my wallet at my side, letting the guy know I wasn’t going to struggle with him. I could see the whole event reflected in the store’s front windows. The only other guy in the shop was the cashier.The main thug clocked him in the face with the gun and demanded all the cash drawers opened. Bleeding down his cheek, the cashier did as he was told, and the thug emptied the tills. Then he wanted something else unlocked; I couldn’t see what it was, either a safe or a box beneath the counter. The cashier said, “I can’t open that,” and the thug protested, gyrating and gesticulating in an armed fit. The thug keeping lookout hurried his parters up. They left the store with a few cartons of cigarettes and an insignificant amount of money. A getaway car in a nearby alley drove the gang to the next target: a gas station along one of Chicagoland’s busiest streets. This heist at my local convenience store, I learned today, was part of a spree that robbed seven businesses, one of them a fortress-like liquor store; a sandwich shop was also hit in broad daylight. All of it was done with a hijacked car the kids crashed while fleeing police; they ditched it and took off on foot, leaving everything on the floor: cash, cigarettes and the gun. I was happy to learn that the pistol was real and loaded: the vision of my death had not been on account of a pellet or squirt gun. Today I went in to view a police lineup and a series of photographs. I successfully identified two of two arrested thugs. The detectives claimed this was very important, as other witnesses had been unable to recognize anyone. Strangely, the men I saw did look very similar to each other, an odd mix of opaque anger in their eyes and blithe apathy in their body language. I’m left with a dumb sense of confusion following today’s lineup; it did not provide any sense of closure or a feeling that justice had been served. I won’t get into our nation’s gun debate or try to counter the argument that all of this could have been avoided had I entered the shop with an M-16; and I don’t want to beat myself up (again) over my failure to invest in Lockheed Martin back in 2003. We have armed teenagers running around hijacking cars and holding up gas stations. We’ve gotten used to it. We feel it’s normal, even inevitable, and we’ve found all sorts of ways to separate ourselves from these events. What do you expect, people ask, from kids who don’t have responsible parents or teachers? It’s a good question, one that begs so many others. Categories: Culture, Psychology, PTSD, Trauma | Tags: urban violence; armed robbery; PTSD; guns; fear; trauma; PTSD; triggers | Permalink.